← Simhasana: This pose may look silly but it comes with great benefits. The fingers should be interlocked and fit together without spaces and without gripping. Think of the interlocking of your fingers as the dove-tailing found in fine furniture. The top of the thumbs should touch, not fold over each other. The radius bone at the wrist should be perpendicular to the floor as show in the top left photo. The fingers should NOT spread apart as shown in the left middle photo. The forearms should be pressed firmly onto the floor from the wrists to the elbows as shown in the left bottom photo. 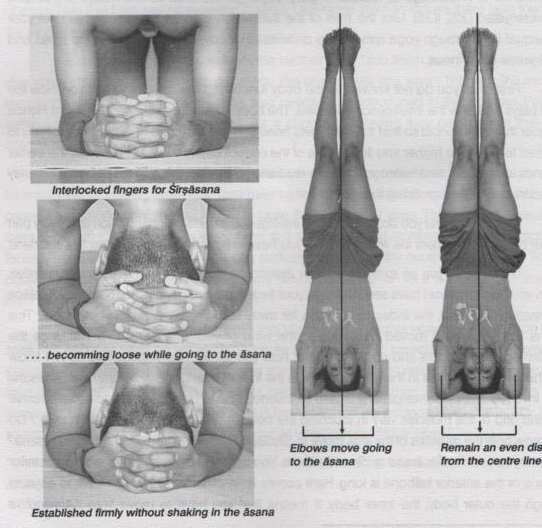 Watch the elbows as you move into Sirsasana. The elbows should be directly under the shoulders as shown in the above photos on the right. The elbows should remain an even distance from the center line of the body. The moment students move into Sirsasana the elbows shift out away from the shoulders. This will place undo stress on the cervical spine. Refraining from ‘hopping’ up into Sirsasana and keeping the forearms firmly rooted onto the floor will help keep this from happening.